ThEm DoLLz is about to make a hometown splash! Almost all the clowns are packed into the car for Circus Posterus “Traveling Circus” at Rotofugi, but we still have much to show you before the opening. 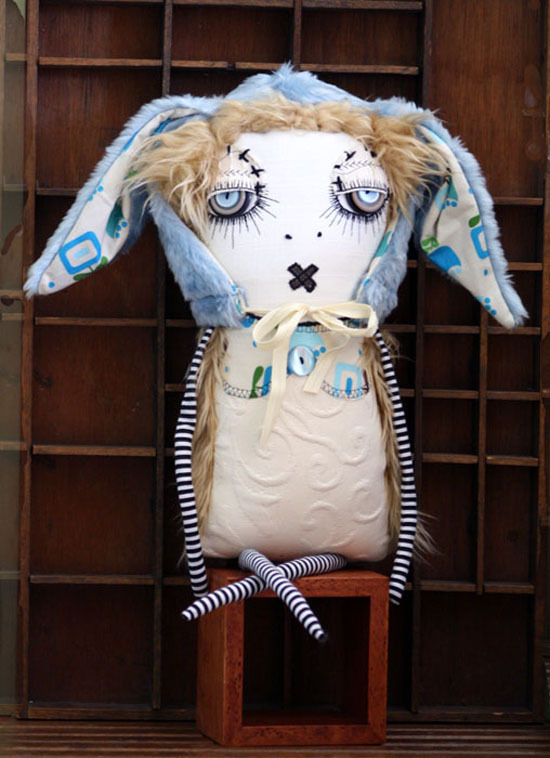 On that note, Jen Musatto is set to make a big hometown splash with her ThEm DoLLz gracing the gallery shelves. Jen has been planning, designing, and sewing these plush masterpieces for weeks, and we finally get to see them in person this Saturday the 15th. How about a preview of a few? Circus Posterus’ “Traveling Circus” opens February 15 and runs through March 9th at Rotofugi. Exhibiting artists include Stan Manoukian, Tim Lee, Chris Ryniak, Amanda Louise Spayd, Joe Scarano, Stephan Webb, Shing Yin Khor, Katie Carillo, Jen Musatto, Brandt Peters, Kathie Olivas, Valency Genis, and Travis Louie. Hometown hero Jen Musatto aka Them Dollz, is in full on prep mode for the Circus Posterus’ “Traveling Circus” at Rotofugi this February 15th. 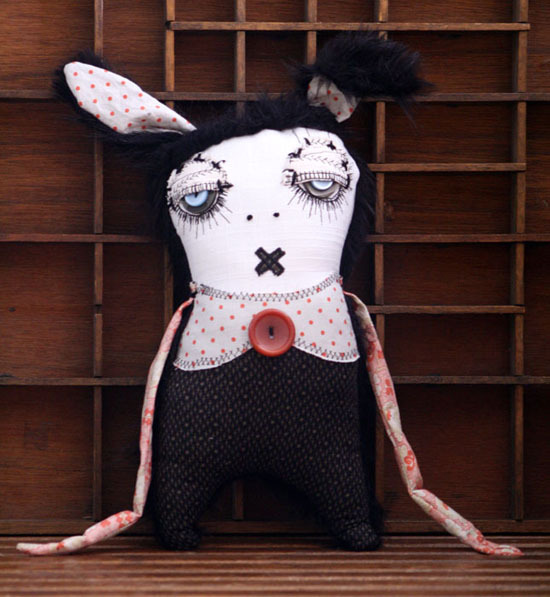 Coming off her succesful December show in Stranger Factory’s project room, this emerging plush maven is making quite a name for herself. This work in progress titled “Chloe” is being assembled before the big show, and this is certain to turn heads because she has bunny ears. We all love bunny ears! We will have more soon from Jen , so keep checking back. Circus Posterus’ “Traveling Circus” at Rotofugi opens February 15 and runs through March 9th. Exhibiting artists include Stan Manoukian, Tim Lee, Chris Ryniak, Amanda Louise Spayd, Joe Scarano, Stephan Webb, Shing Khor, Katie Carillo, Jen Musatto, Brandt Peters, Kathie Olivas, and Travis Louie. 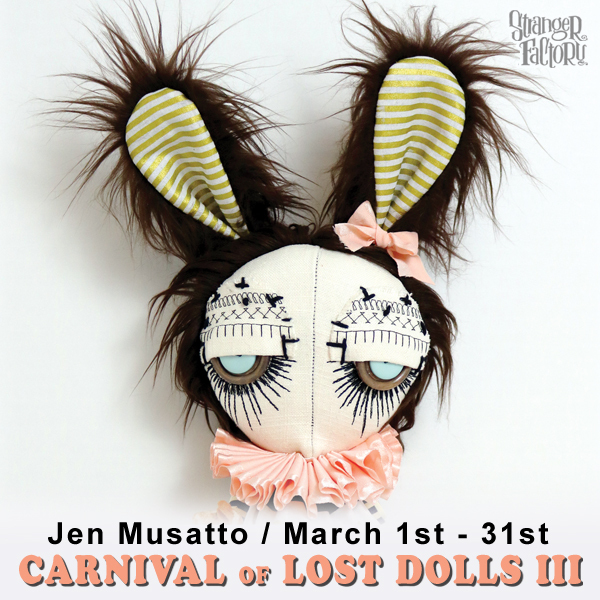 The Stranger Factory Project Room will be filled to capacity this weekend with the brilliant craftmanship of Jen Musatto (Them Dollz). We have been bringing you numerous updates over the past few weeks on what will be at the show, and we realized we haven’t even grazed the surface of all the work. With that in mind, how about another preview? Meet the ever so lovely Josette. Now you may fall for her mesmerizing blue eyes but behind those babies lie many secrets. She is a sinister gal, but shouldn’t let that dissuade you. She is dressed to impress and break many hearts in the process. Look out boys, if you are in Albuquerque this Friday for the opening, but don’t fret too much because Jen will be on hand to keep her in check. 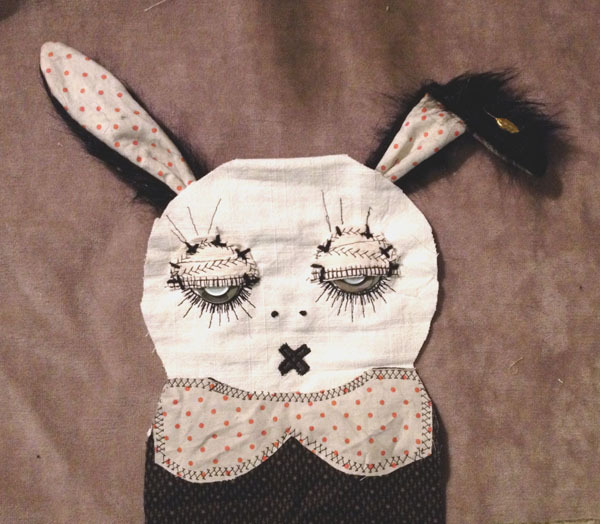 Jen Musatto’s exhibit opens in the project room December 6 at 6pm. Jen will be attending to talk about her creations and meet with all in attendance. Don’t let their disgruntled demeanor and stitches fool you, Beep and Bop are just wishing they were at the circus. 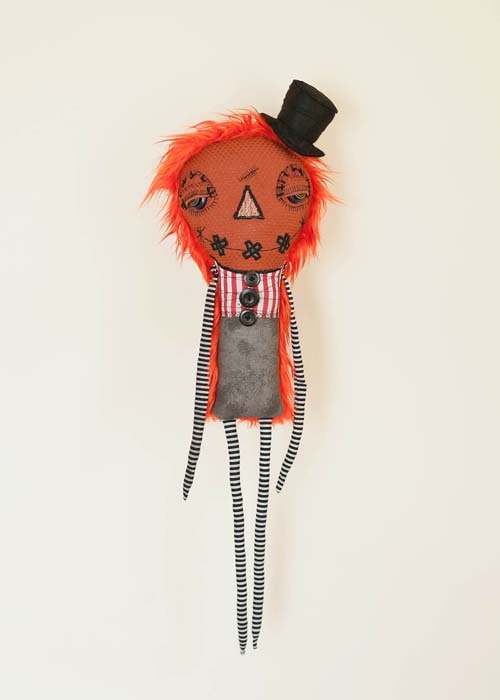 They don’t have to wait too long, because Jen Musatto aka Them Dollz has them en route to the circus we know as Stranger Factory. Beep and Bop are two monster boys that live for the circus. Everything about the circus excites them from the rides, to animals, the clowns, and especially the extra sugary cotton candy and delicious salted peanuts. If they had their way, they would be the leading stars under the big top. Their matching attire of stripes and hats is all part of their act, but the thing is they don’t just have one-act, they have every act. Being such avid connoisseurs of the gilly, they believe that have mastered every performance from juggling to high wire (even if they have yet to practice). They know what they love, and nothing is going to stop them. 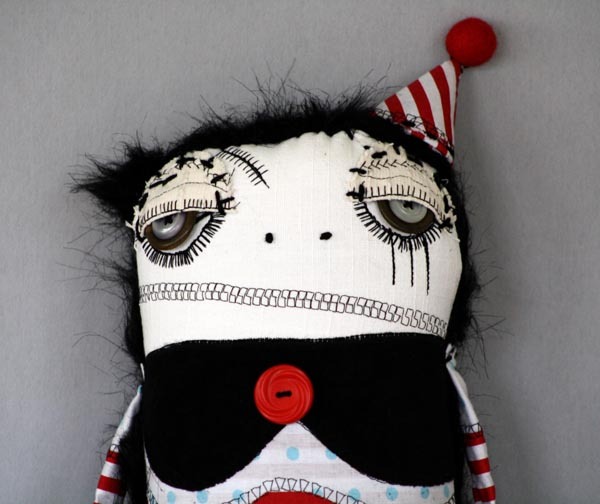 You can see Beep and Bop at Stranger Factory when Jen Musatto’s exhibit opens in the project room December 6 at 6pm. Jen will be attending to talk about her creations and meet with all in attendance. Are you ready to give your eyeballs and plush heart a much needed jump for today? 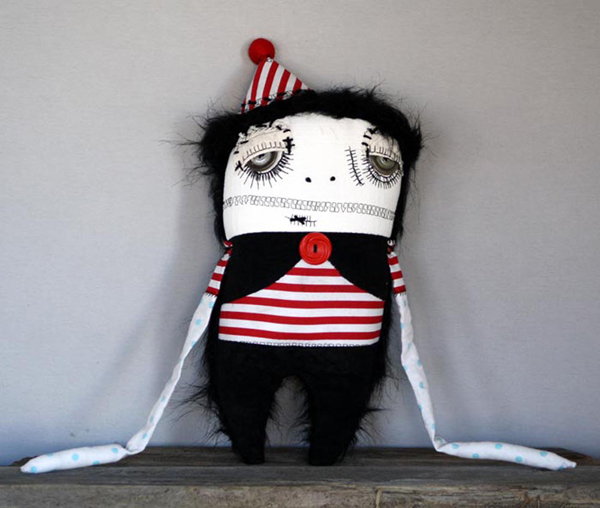 We have not one, but two, reveals from Jen Musatto‘s show this December in Stranger Factory’s Project Room. Grab your best attire, and look at Them Dollz below. Up first is Abel Pettymore who sits dapper and coy with his long mane and top hat. Don’t let this gent fool you, behind those sullen eyes and bow tie is a true badass. Only badasses wear stripes like that (like Beetlejuice). Not necessarily his partner in crime is Iris Von Straus. Iris prides herself on her beautiful, lush hair and fast living lifestyle. Able to put all patrons of the dance floor to shame, Iris’s version of the Charleston and Shimmy drop all the jaws. Look out, Albuquerque! For more on Jen Musatto and Them Dollz, see Jen’s Project Room exhibit at Stranger Factory December 6th – 29th, with an opening reception on Friday, December 6th from 6 – 9 PM. Who doesn’t love something conjoined? 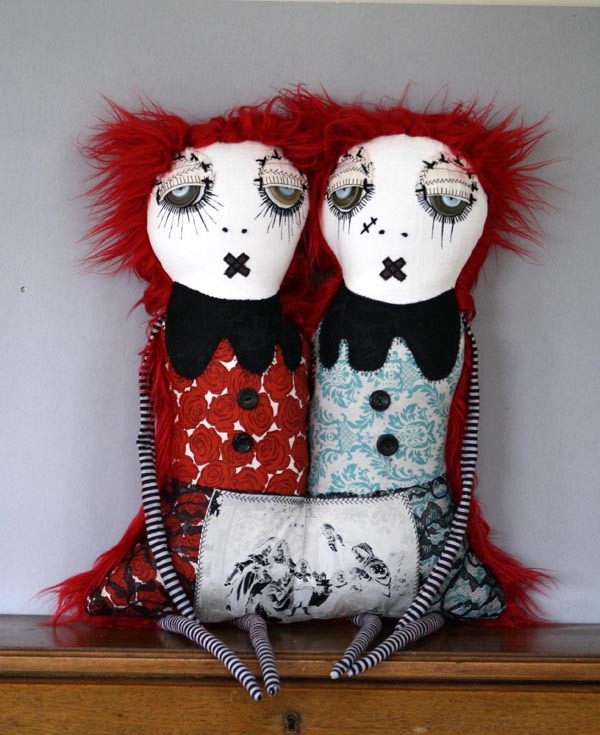 For her show this December at Stranger Factory, Jen Musatto aka Them Dollz has brought the conjoined dolls out from under the stairs. Dressed in their best cherry red and turquoise collar dresses, these two are not impressed by my attempts at writing. Conjoined at the hip with two arms and four legs, this doll will be a hit when it arrives at Stranger Factory soon. Jen’s Project Room exhibit will run December 6th – 29th, with an opening reception on Friday, December 6th from 6 – 9 PM. Just like any project, proper planning comes into play. 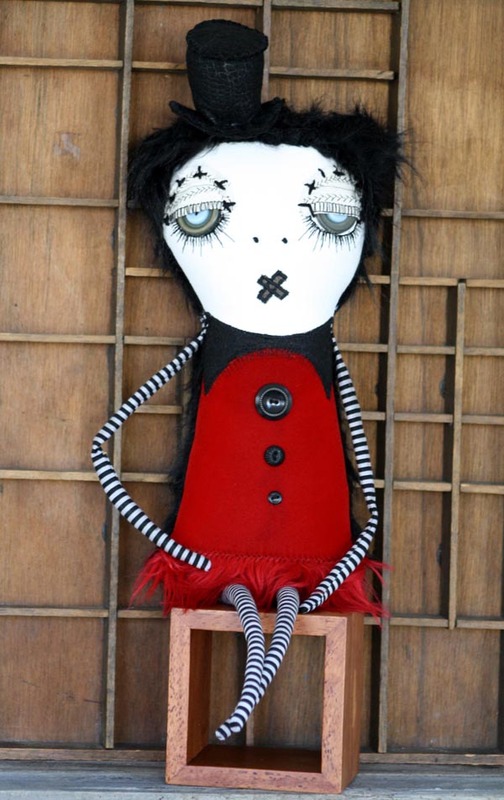 With Jen Musatto “Them Dollz”, it takes figuring out the right patterns and arrangement to create the perfect doll. 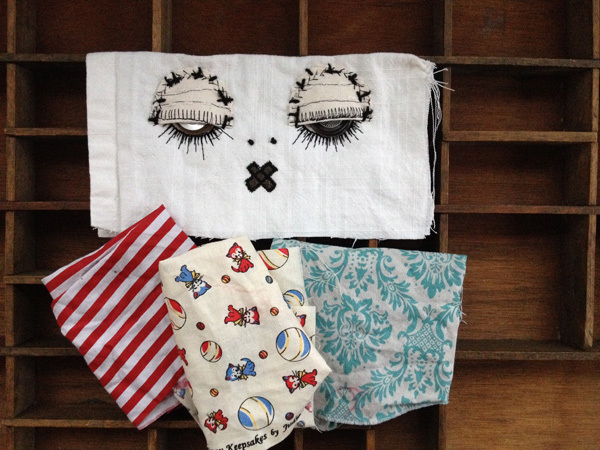 Jen takes her time to pick out the proper fabric and pattern when putting together her perfect creations. 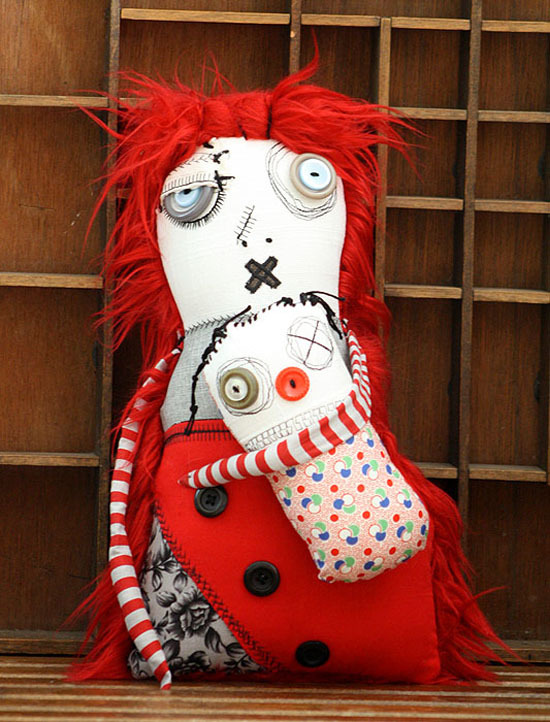 Her dolls are a fluid combination of movement and patterns in a rag style, which composes a story all their own! 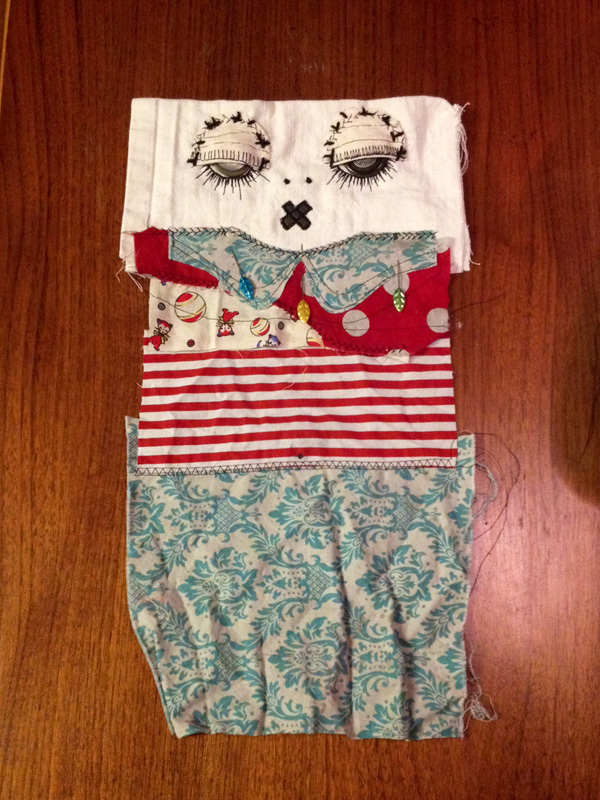 We get to see Jen laying out some styles here before she gets sewing and stuffing. The finished products will be available soon, and we will most definitely bring you the scoop. 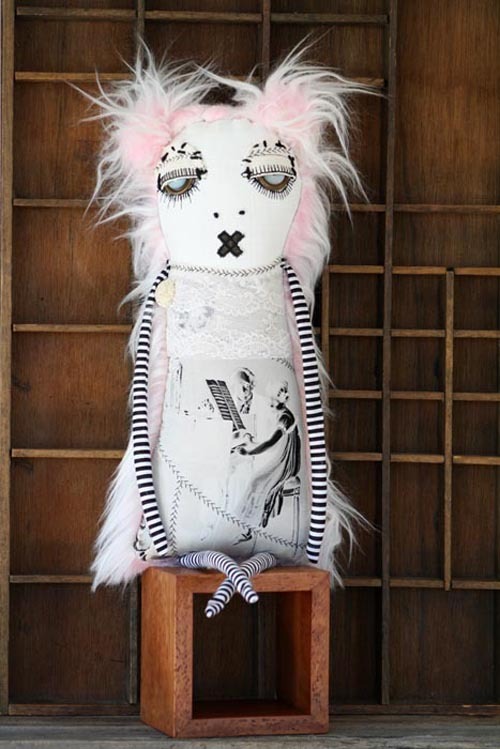 Jen Musatto creates “Them Dollz”, a line of handcrafted plush dolls that evoke a broken and gloomy image of childhood where innocence and the longing for companionship take a most unusual form. Musatto’s dolls are immediately unsettling, but give the viewer room to slowly bond with them over time. 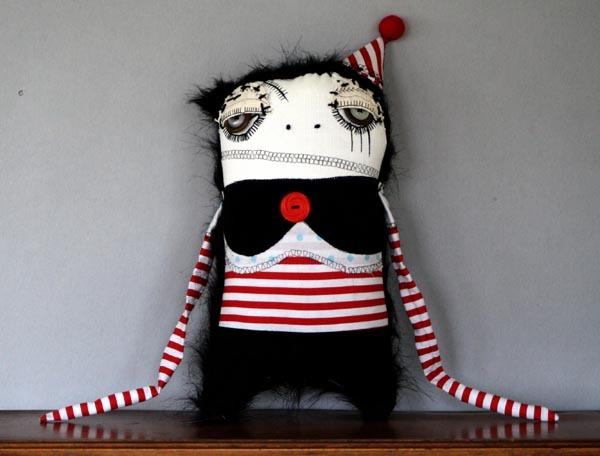 Made from a combination of new and found materials, Musatto’s “Them Dollz” figures are each wholly unique and provide a fresh, if slightly creepy, voice in modern plush art. 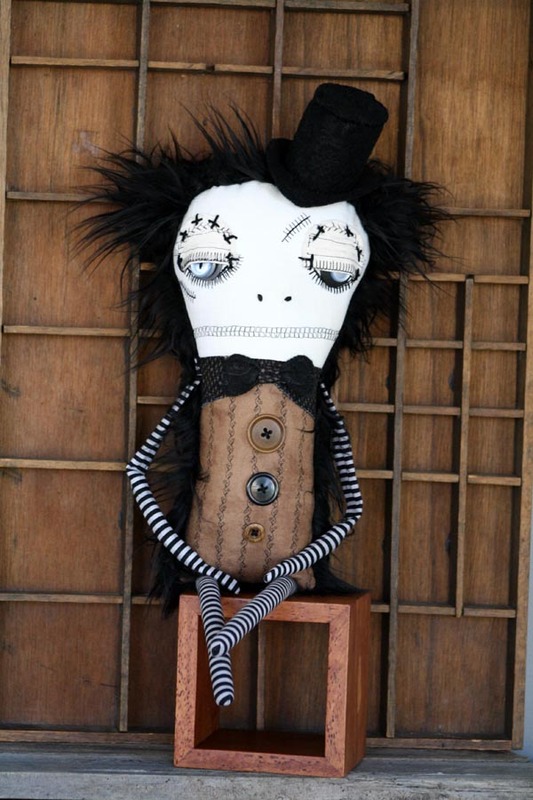 We are gearing up for third annual installment of Bewitching at Stranger Factory. 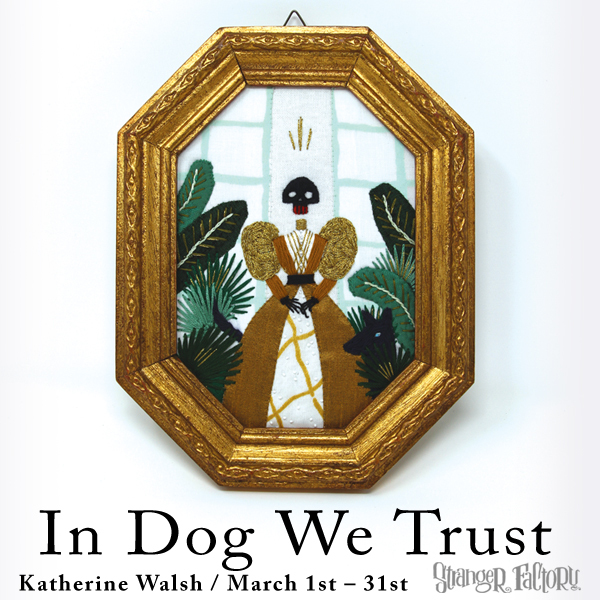 This highly anticipated group show happens every October, and the lineup this year is once again phenomenal, so sit back while we slowly roll out the ghosts, ghouls, and Halloween-esque works leading up to opening night. 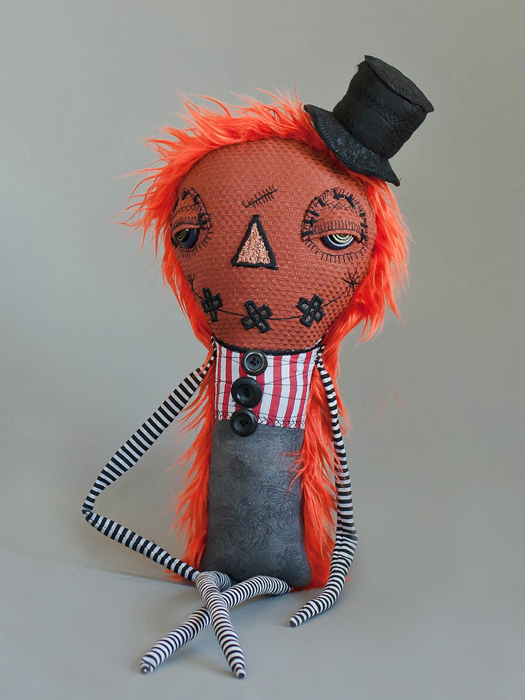 Up first, we are proud to show you Jasper Pumpkin by the talented Jen Musatto aka Them Dollz. 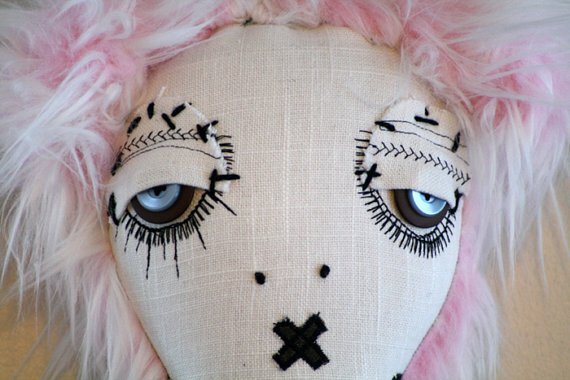 Jen is no stranger (pun intended) to our misfit world and will be also have a solo show at Stranger Factory in December. An exquisite master in the plush arts, she is a perfect fit for Bewitching! Jasper is decked out in his Halloween colors and top hat and is ready to frighten all the trick or treaters even if he can’t say much. He isn’t a small fry either because he is 26″ long, 8″ wide at his head, and 4.5″ thick of pure pumpkin! Stick him next to the candy dish or the pumpkin patch, because that is where he feels most at home. We will have more from Jen and many more of the artists in Bewitching III before the show opens October 11th, so keep an eye out right here.